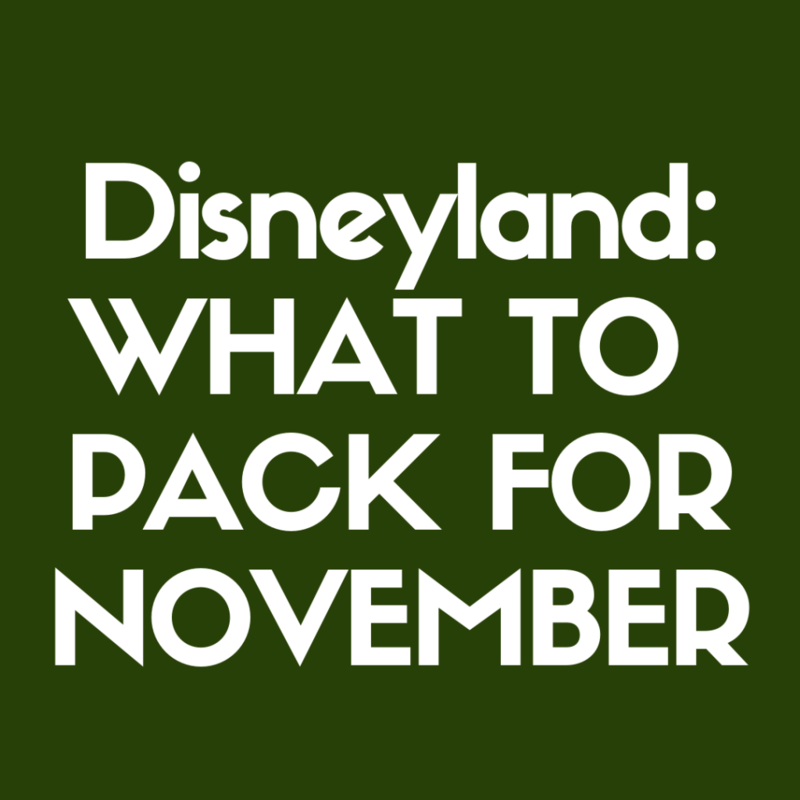 Packing for a November trip to Disneyland Resort brings on the beautiful colors of fall and the holidays.It also means that you’ll need a diverse attire with layers to pile on for a full-day excursion. No matter what trip you plan, you want to be prepared. Although Disneyland seems like a relatively mild expedition, a full day entails being on your feet a lot, moving through crowds (sometimes of coughing and sneezing folks) and dealing with fluctuating temperatures throughout the day. In order to prepare for this journey, you’ll want to check the weather, pack some extra clothes and grab your hand sanitizer! Disneyland weather is mostly temperate year-round with some showers, a few (rare) downpours and lots of sun. In November, you’ll see the flora change color, courtesy of the amazing gardeners who keep the parks seasonal and beautiful. However, this mostly reflects the sentiment of fall rather than the actual weather for a California autumn. On average, November temperatures sit in the mid-70s during the day and the low 50s at night. However, with the potential of 20-plus degree fluctuation in one day, you’ll want to prepped with layers. On the bright side, clouds tend to be light except for rainy days, which are mostly infrequent until winter comes. When packing for your Disneyland visit, you’ll want the staples of daily outfits, personal toiletries, an extra pair of shoes, and so on. 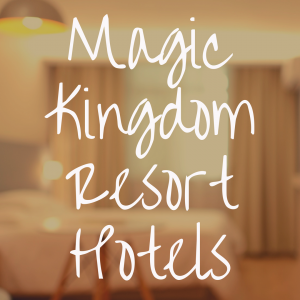 The unique difference with a Disney vacation or stay-cation is that your gear revolves around a singular destination. 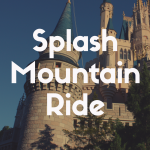 Rather than packing for three or four excursions, you’re planning for attractions and showtimes. Moreover, you’ll be planning the day based on whether you can leave the park to grab an extra jacket or new socks. As such, your day or days at Disney require more consideration than just the basics to ensure your visit is truly magical. Disney gear is always a plus! While it’s great to have everything above for the whole trip, you’ll want to think about what to take with you inside the park. This is where a backpack or locker rental come in handy. While most things in Disneyland Resort are sold, you can always utilize resources like the First Aid Stations and water fountains for basic needs. Some of the beverage fountains in buffet-style restaurants will also allow you to fill your water bottle with cold water and ice. The last big freebie is Wireless Internet Access points through the parks. Be sure to download the Disneyland Mobile App and select Guest Services in the drop-down menu over the map to find your needed resources! Whether you’re going for a single day or multiple days, whether you’re coming from a local town or way out-of-town, you’ll want to be prepared for anything. If you’re staying at a hotel but don’t want to miss a minute in the parks, consider bringing a backpack for the whole group to bring the same things rather than individual bags. If going back and forth is in the itinerary, it’s best to stick to the basics for the day, more or less. When possible, everyone should carry their extra gear on their persons to avoid renting a locker. November is part of flu and cold season. This means you and your travel group are more likely to be exposed to germs when visiting Disneyland. So, don’t let viruses pull away from the magic! Depending on the severity of the flu season, which will be reported frequently on every major news network, you’ll want to plan accordingly for everyone in your crew. Pack extra supplies to help prevent illness from spreading. Whether your child is an infant or a teenager, packing for kids means double-checking that they have everything they’ll need and want, plus a few things that are “just in case.” Here are some quick tips on how to prepare for everyone, no matter how young, in your travel group. Of the age ranges visiting the Resort, the youngest are the hardest to pack for when actually in the parks. Strollers, in particular, have been a point of controversy at theme parks, and Disneyland is no different. While it is the most magical place in the world, strollers have stricter rules and physical limitations that even Tinkerbell can’t fix! 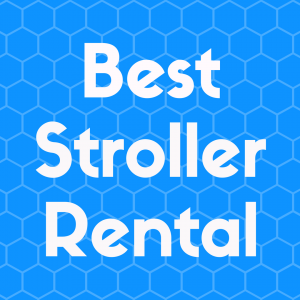 You know the positives, but it really does boil down to whether or not your child needs a stroller for transportation, naps and more. When the answer to whether you need it is plainly “yes,” here are some strategies to make your trip easier. 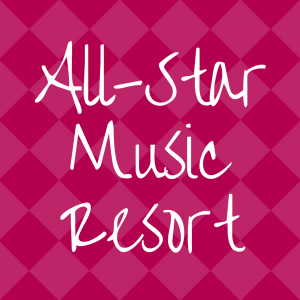 Rather than bringing your own, rent a stroller at Disneyland for about $15 per device per day! 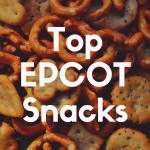 Whether you’re working with a picky eater or someone who just needs food all the time (*scoff* teenagers), snacks and drinks are a great addition to your family packing list. Be sure to pack things in plastic containers or original (plastic or metal) packaging to avoid slowing down the entire security check-point. Also, avoid bringing large ice chests. As a note, there are lots of options around both parks for little ones and big ones alike. You can pick up apple juice, chocolate milk, or Mickey’s apple crisps, but getting to them can be difficult and time-consuming with a stroller and/or crying child. Note that many of these vendors are not simple concession stands; they are mostly built-in store fronts like Tropical Imports (Adventureland) or fruit cars in Critter Country and Fantasyland in Magic Kingdom and Mortimer’s Market (entrance to Buena Vista Street) and Fairfax Market (Hollywoodland) in California Adventure. Thus, having them on hand is a simple, cheap way to reduce your hassle and enhance the magic. From blankets to toys, your youngest Disneyland Guest will be your most demanding. Not only does the trip typically disrupt their regular schedule, it tests their patience in ways that they have likely not yet been exposed. Nonetheless, the excitement of it all is salvagable — tears may even be preventable! When bustling around the parks, cries and screams of kids ranging from simply tired and grumpy to full-on tantruming can be heard. Although some of this is hard to prevent or predict, preparing for the worst is a parent’s best hope to enjoy the day themselves. Don’t be afraid to bring beloved toys and blankets. Prepare for naps for youngsters who still need them to make it until the fireworks. Dining gear is also a plus to ensure they’re not completely covered in food and drinks before lunch. Ultimately, it’s important to remember that as excited as you are for their first visit, they are still youngsters. Keep your memories happy by keeping them happy. Disneyland lights up for the last few months of the year with October’s Halloween Time through their Holiday Magic. During November, you’ll either just catch the transition at the beginning of the month or be fully engulfed in Christmas spirit in Disneyland Park and the Festival of Holidays, a cultural manifestation of the most magical time of year, at Disney California Adventure Park. Pack your favorite holiday gear for Turkey Day and the Christmas season alike when you visit Disneyland Resort in November! Beginning mid-November, Disney California Adventure transforms into a celebration of the holiday season, featuring the Festive Foods Marketplace and Disney ¡Viva Navidad! No matter what occasion you’re celebrating, it’s a perfect time to take memorable group and family photos with amazing backdrops featuring icons of DCA like the Pixar Pal-A-Round ferris wheel and Cars Land main street. A perfect time to rock adorable holiday sweaters or the ugliest holiday ugly sweaters, fall and winter in Disneyland make for great photo ops with beautiful backdrops for your seasonal greeting card. Plus, you can even check in Disney stores for special editions of ugly sweaters! So, when you go to pack your bags this Novemeber, grab your favorite Disney gear featuring Mickey and Minnie, Jack and Sally, the Princesses, and more to blend in seamlessly with the season. Throughout both parks, your favorite characters will meander around in their best holiday attire. Catch a photo with them to make your holiday card that much more memorable and magical! Santa in particular will be awaiting your visit at Redwood Creek Challenge Trail in DCA. For little ones, this is a prime opportunity for that super-cute Santa photo for the year (without the mall line!). While it may be a bit of a wait to see the big guy, the line will be much more entertaining with options to run around the challenge trail! Looking for a more classically Disney photo op? Wait until just after sunset for a pristine view of the castle all lit up and covered in shimmering snow. No matter what you’re wearing, you’ll want to capture that moment. Be sure your phone and camera are fully charged! Lastly, if you’re going to Disneyland in November, you can knock out the classic Christmas tree background for your collection with one of the world’s largest trees! At the top of Main Street, you’ll see the glistening beauty waiting for your photo. Be sure to check for presents underneath its boughs!